A gang of Bedouin grave robbers were caught red-handed Friday evening, searching a sheikh's grave for boxes of gold. 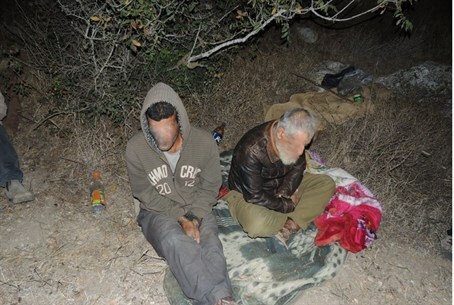 A gang of Bedouin grave robbers were caught red-handed Friday evening, as investigators for the Archaeological Authority and police from the Ashdod and Ashkelon police stations closed in on the robbers as they attempted to steal ancient treasures. The five thieves, from the town of Rahat, were caught at the Tel Ashdod dig site, near Road 4 off Israel's Mediterranean coast. Investigators said they had been following the gang's movements for weeks, preparing for the day they were to carry out the dig. The five were caught inside a pit they had dug adjacent to the grave of a medieval sheikh, holding tools that they were using to extract ancient finds from the site. The site, said archaeologists, contains finds that are up to 5,000 years old. They were arrested and detained, and taken to an Ashkelon courtroom, where a judge extended their remand. They are to be indicted on charges of pilfering antiquities and grave robbing, officials said. The five said they were digging the site in search for boxes of gold, which according to local lore are hidden there. Officials said that the five did not find gold, but did cause a great deal of damage to important archaeological finds as they searched for the gold. The Archaeological Authority said that removal of archaeological finds is a crime, and violators of the law will be prosecuted to the full extent of the law.